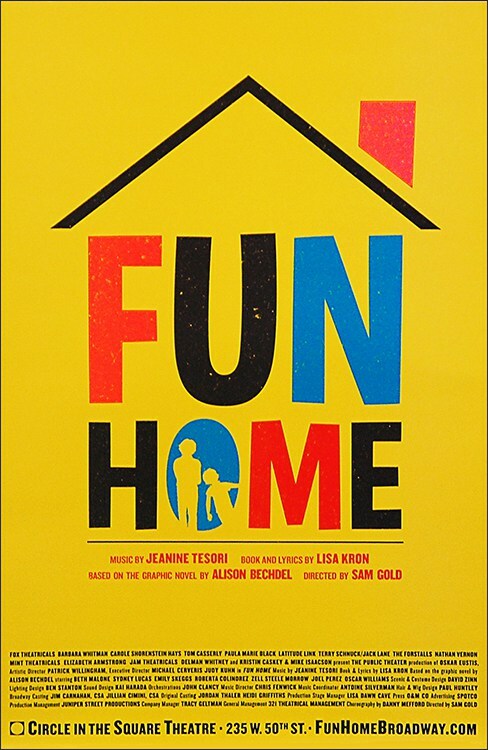 Last Saturday night, I got to (finally) see Fun Home: the Musical. I am a HUGE Bechdel fan. I starting reading Dykes to Watch Out For secretly, when no one was looking, while shopping at a women’s book co-op tucked into the basement of a Carytown food co-op while I was in graduate school in Richmond. My very first therapist had told me where it was in hopes, I think, that I would realize both that I was a lesbian and my boyfriend of the time was an abusive asshat. The bookstore had a central table and all the Dykes collections were tucked onto the side of the table toward the back of the store, and my glimpses of the interiors of the five books that were available then made me wonder where I could find these amazing women, or people like them. I was disappointed that the women who ran the co-op weren’t Mo or Lois or Ginger, despite their best efforts to bring me into the circle. Eventually, I ran out of excuses and halfway workable lies to tell my boyfriend about where I was going, and I stopped going to the bookstore. I didn’t see more of Bechdel’s work until a few years later, when I left that asshat and got together with my current wife, who owned all the collections. I read through them ravenously and then kept current via Lesbian News, which always had a set of the latest Dykes in the center of the issue, and eventually moved to the web, where Bechdel was posting them on her website. Naturally, when Bechdel first published Fun Home, we bought it almost immediately. (We were also lucky enough to get hold of an autographed copy of the sequel, Are You My Mother?) If I’d been more familiar with NYC, as many of my friends are, we probably would have seen the musical sooner, but I am something of a coward about traveling, and require some time to adapt myself to the idea of going somewhere relatively new. In this case, travel was facilitated by a friend who so strongly recommended the show that she offered us crash space at her house if we wanted to see it. So we took her up on it. So after spending the afternoon at the Met, we settled down to wait in the lobby of the Circle in the Square Theater on Broadway, and watched people come in, including many of the actors. I was feeling tense already. I’d read reviews, I’d watched performances of “Ring of Keys,” I’d read Bechdel’s reaction to seeing it. I was afraid my expectations might be too high. I was a little afraid of my own reactions to seeing it. Annnnd right from the dimming of the lights and, “Daddy, hey, Daddy, come here, okay?” I was sitting on my vast array of feels and trying to keep them down.